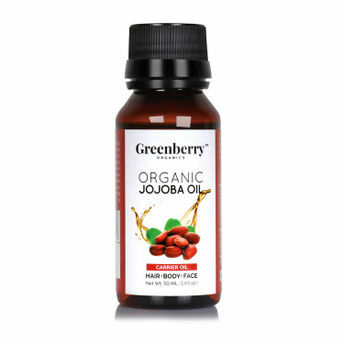 Greenberry Organics Organic Jojoba Oil is a 100 percent pure, organic and naturally-sourced beauty solution from California. Organic jojoba oil is high in vitamin E and B complex. Suitable for hair, skin and nails, its nutritive properties are exceptional in achieving that radiant skin and lovely mane. Rich in antioxidant, this oil restores skin ageing and prevents free-radicals, leading to a youthful looking skin. This oil can be used on body to provide nourishment to the skin. Jojoba oil can revive dry and damaged hair. Suitable for all skin types, this oil helps in hair growth and can work as a conditioner. 100% natural, pure and organic jojoba oil: Extracted from the natural edible jojoba oil containing rich vitamin E and B complex. USDA certified, cold pressed and sourced from California. About the Brand: Natural, unconventional, effective, is how the Founder A " Arjoon Mehra of Greenberry Organics describes their products. Greenberry Organics proudly stands as 0 percent Sulphate organisation and delivers only sulphate-free products. Totally against animal testing, the brand strictly excludes conventional chemicals that are harmful within the long run; these being A " parabens, silicon, alcohol, DEA/TEA, mineral oil, artificial fillers, petrochemicals, phosphates, paraffin wax, phthalates and synthetic colours. All Greenberry products are derived from the blend or rarest herbs and oils, ensuring amazing result oriented outputs. Explore the entire range of Massage / Carrier Oils available on Nykaa. Shop more Greenberry Organics products here.You can browse through the complete world of Greenberry Organics Massage / Carrier Oils .